Instagram Stories should come to complement your content feed strategy and bring a touch of authenticity to your audience. With stories, you can leave all your inhibitions and filters at the door. You’ll have the chance to be rough, to be bold, to be authentic, to be imperfect…in the most perfect way possible. But that won’t happen by chance. You’ll need to be strategically spontaneous. That means planning in advance for all those Stories that will appear crafted in the moment. So how do you do that? Where do you start? And how do you make sure your Instagram Stories tell a coherent and persuasive…story? The first step towards creating a successful Instagram Stories strategy is to set up your objectives right. While you might say d“to gain more customers, d’oh!”, things are not as simple as that. The way to think about this is to break it down into smaller objectives that will ultimately help you achieve your main goal. For example, do you want to find out more details about your followers? Do you want to grow the sense of a community? Do you want to present your products? Do you want to offer a behind-the-scenes view? Choose up to 5 smaller objectives and also think about how you can measure up the results. This will help you to keep a constant reality check of your progress. Now that you have your objectives noted down, it’s time to plan the specific tactics that will help you attain them. What’s more, besides what goes in the Stories, you’ll also need to think about their aesthetics and overall look and feel. And, if you’re wondering what type of content to include, here are a few ideas. How-to and tutorials: show followers how your product or service works or take a new spin on it! When drafting your initial strategy, try to think of all the types of Stories you could create and leverage the benefits from each. We already talked about all the juicy story modes, so start from there and move your way up to the creativity ladder. Video works best but always think about your videos as if everybody was watching with the sound off. Oh, and make sure to include the d“sound on” sticker to let people know that they’ll be missing out on something awesome if they don’t turn it on. A live is always a great idea, because followers will receive push notifications. You’ll be more visible, but make sure to stay relevant! Photos with stickers should be your go-to type of content for an easy pick-me-up, but don’t go dull. One of the various benefits of using Instagram Stories is that they can get you in front of your followers more often than your feed content does. And, even better, Stories can become another means for you to be found. So, let’s dig into how you can turn these opportunities into even bigger chances! A proven way that will get you more views is to spread your Stories evenly across the day. A great timing to follow is morning around 8 am, afternoon around 2 pm and evening around 7 pm. This way you’ll reach all the possible types of followers that interest you, no matter their activity patterns. Each Stories post will boost the other, bringing your content in front of followers once again. This doesn’t mean you can’t post multiple Stories at once, as long as these make sense as a whole. However, if each Story is not a direct continuation of the other and can be posted later, save it f! In the long-run, it will bring you more views. Adding geotags to your Instagram Stories increases your chances of getting found. The most straightforward way to use geotags is to add a tag that mentions your location. To do this, click the sticker icon located in the above right corner. Then, choose the location sticker and add it to your story. A pop-up window will open and you’ll be able to search for your location. Another strategy you can use for geotagging is to tag the locations you wish to draw followers from. You know what they say, don’t dress for the job you have, dress for the job you want to have. Thus, while you might be in a totally different part of the country, targeting a specific area can be done through the location tag. A hashtag is a hashtag no matter where you place it on Instagram. And adding hashtags to your Instagram Stories has the same effect as adding them to your captions: it broadens your reach and increases your chances of attracting new followers. However, beware! While in your captions you can play with various hashtags, it’s not such a good idea to crowd your story with more than one (maximum two) hashtags. Not only will it look bad, but it will also make you come across as desperate and unprofessional. Which is not…erm…cool. Why? The reason is fairly simple. This will gain you a lot more exposure, as it will send a push notification to your followers. In addition, Live Instagram Stories are also marked with a different d“play” button which makes them more visible in the Stories stream. Sure, you could save your Instagram Stories on your computer, or your drive, or on a number of other online storage spaces or hardware gadgets. But Instagram thought (and rightfully so) that it would be amazing if you could have them stored in the form of an Archive readily available directly from your account. This way, you could always be just a few clicks away from revisiting your Stories and adding them to the Highlights feature (we’ll get to that shortly). Okay, the premises sounds great. But let’s cut to the chase: how can you add your Stories to the Archive? Simple. All you have to do is turn on the Archive option from your Settings. Just as Cinderella rushed to get home before the clock hit 12 o’clock, Instagram Stories also fought a battle against time. But no more! Cinderella no longer cares about old-fashioned prejudices (she can arrive on her skateboard at the ball, who needs a carriage?) 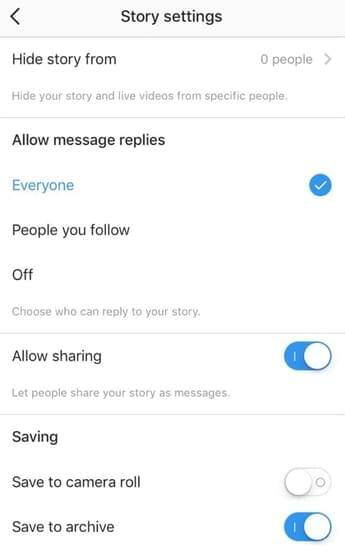 and Instagram Stories now have a Highlights section where they can linger without counting the hours. And this new feature brings a lot of juicy benefits to marketers. Why, oh, why? Well, it provides a very elegant channel of curated content to greet your followers as soon as they land on your profile. Think about Instagram Stories Highlights as the d“welcoming committee” introducing your multi-layered brand experience. Stories Highlights will appear right below your profile description as a circle. Once tapped, the circle expands to reveal a slideshow of stories curated by you. The Highlights can be grouped into various sections and will remain of your profile forever and ever and ever. Or until you delete them. While your whole account is dedicated to this goal, the Instagram Stories Archive can capture your products or services in a more authentic, serendipity-like light. And you can do this in a variety of creative ways, either by creating specific products’ categories based on their type or even your audience. Everybody loves a sneak peek of what happens off-screen. And Instagram Stories is the perfect tool to capture the d“on the spot” action. Now, with Instagram Stories Highlights, you can create an everlasting gallery with the juicy moments caught red-handed. There’s no greater feeling than the feeling of recognition. So if you want to really sweep your followers off their feet, create a Highlights category just for them and about their experience with your product/service. You can build a strategy upon creating content based on their experience or you can simply reuse the content they created in connection with your brand. Either way, you’ll achieve a strong sense of community. 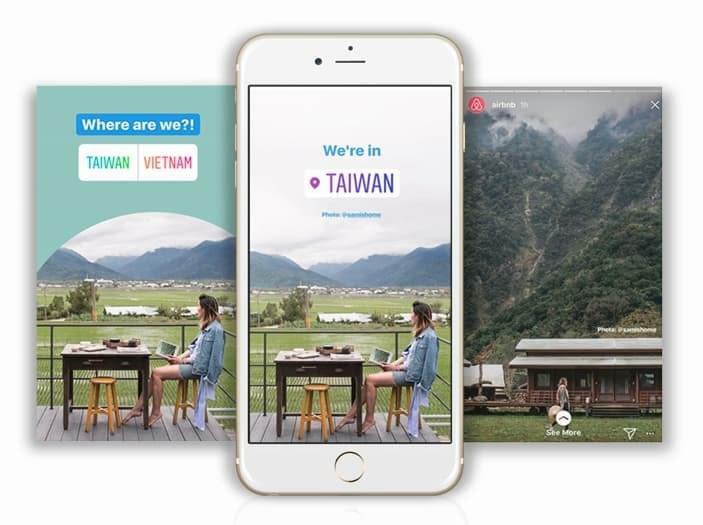 If used smartly, the Stories Highlights can become a great way to promote your current marketing efforts in terms of promotions, events or other endeavors. By grouping them all together, followers will easily get a sense of what your values are and what they can expect in the future. Hopefully, they’ll like it and come back for more. If you want to improve the results you’re getting with Instagram Stories, you’ll need to have a close look at the metrics recorded in the Insights section. These will help you reach important conclusions regarding what types of stories work best, which are the most engaging, how followers interact with them and so much more. By applying these findings you’ll improve your Instagram Stories content and strengthen the connection with your followers. These 2 metrics are the cornerstone of your activity on Instagram Stories. The reach metric measures how many users have seen your Story, while the impression metric shows you how many times your story has been viewed. The number of impressions will always be equal or bigger than your reach, since impressions count all the times your story is viewed and not individual users. Constantly checking your reach and impressions and comparing them will let you know if you’re doing things right or if your strategy needs to change. Also, it will show you exactly what type of Stories are best received by users and you’ll be able to do more of those. A drop in impressions might hint to low Stories quality, so make sure to step up your game by going back to the drawing board. Work on the quality of your photos/videos and the texts in them. Also, make them re-watchable! Add an element that will get users coming back, whether it is a pun, some valuable insights or just a stunning picture/video. If you want to better assess the quality of your Instagram Stories, these are the metrics you need to check. Although they do require a bit of interpreting, they can reveal valuable info about the degree to which your stories engage people, are understood and manage to hit their objective. The taps forward represent the number of times users tapped to view your next story. The taps backward, the number of times users tapped to view your previous story. While a big tap forward metric might be an indicator that your story wasn’t convincing, a high tap backward count is a good sign, telling you that users found your story interesting enough and wanted to rewatch it. Now, the metric you should fear most is the exit rate aka swipes away. An exit is counted each time an Instagrammer jumps over all your stories to view the ones of next users, closes the Stories section or Instagram all-together. After reading these specific metrics, you’ll be able to work on the coherence of your Stories. Even if you post your stories at regular intervals and not all at the same time, you must make sure that they are part of the same umbrella-concept and make sense together. Also equipped with the knowledge of which types of media are preferred by your audience, you’ll make better strategic decision in the future and create better content. And, to ensure your exit rate is at its lowest possible, mix and match elements for more interactivity. There might be no other business that does Instagram as Fashion Businesses do. According to a statistics report, the fashion industry represents an impressive 70% out of all activity on the social platform. If that doesn’t cut it, we don’t know what does. But, as you might have guessed, all content created by fashion brands is top-notch editorial, perfect to every detail. However, Instagram Stories brings on a totally different game. And the fashion business is ready to embrace it. Actually, it’s so ready, that on a monthly basis, fashion brands post around 14 stories. And if we’re talking about brands with more than 1 million followers a month, the number revolves around 11 Stories a month. From Nike to Mango and Dior, fashion brands of all shapes, sizes and apparels are simply killing it on Instagram Stories. Mango likes to take followers behind-the-scenes, posting Instagram Stories that reveal what happens during photo-shootings or on the set of their campaigns. The choice of content instantly creates a feeling of authenticity and builds a sense of d“we’re in this together”. 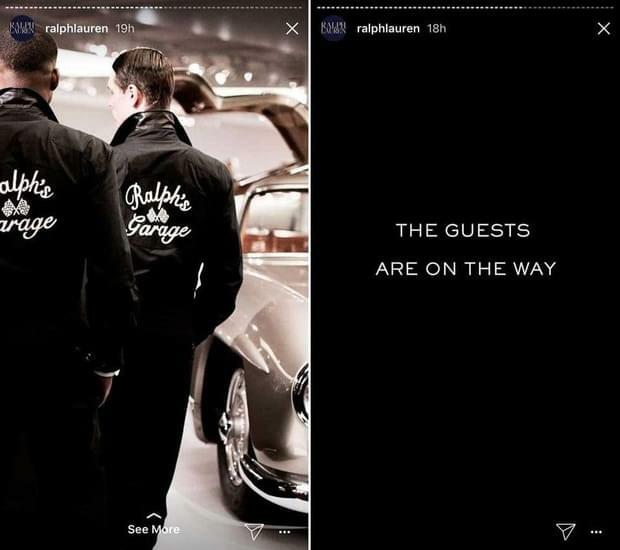 Ralph Lauren made Instagram Stories work wonders during the New York Fashion week with a strategy planned in detail. The brand mainly used the feature to build up excitement by posting teasers alongside with the big reveal. They created buzz about what guests they would have, what type of food they’ll be enjoying, also giving way to countdowns to create a sense of urgency. The aesthetics of the stories remained very Ralph-Lauren-ish, but it accepted and embraced the essence of Instagram Stories. 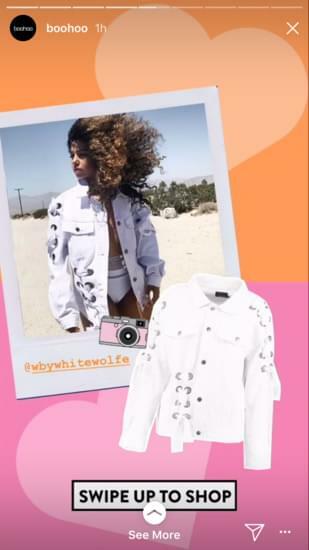 Boohoo is more sales oriented in their Instagram Stories, making the most out of the link incorporation feature to promote their products. 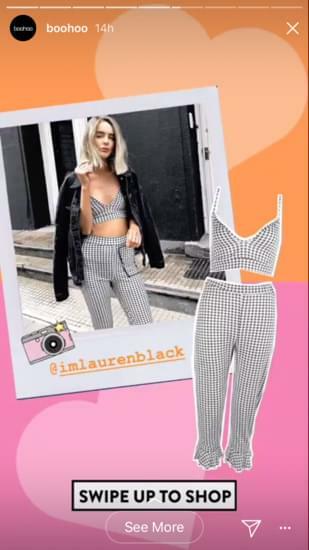 To take things a step further, they use influencers for their shoppable influencer content. Thus, if you’re operating in the fashion industry, don’t get too attached to the feed editorial style. 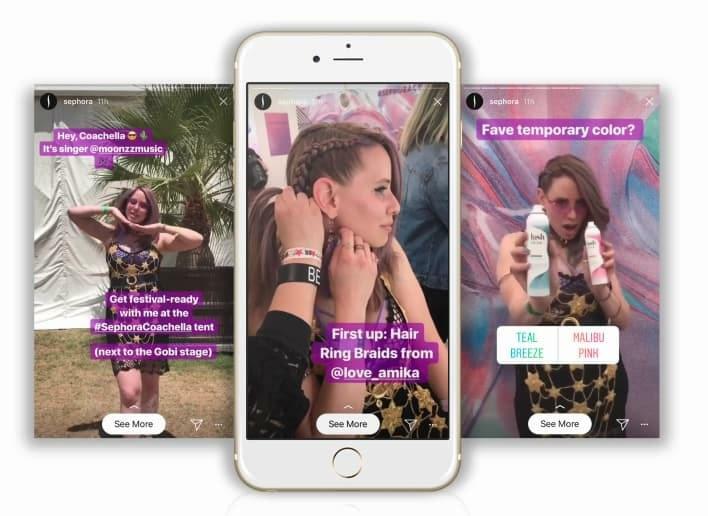 You can achieve great results by embracing the rawness of Instagram Stories and by playing with all its features: use influencers, incorporate links to your products, build excitement with limited offers or teasers, offer behind-the-scenes sneak-peaks from shootings or even do live takeovers with influencers in the branch. On top of the advantages that fashion businesses have in Instagram Stories, retailers and online shops have one more: they are not held by editorial-standards. Actually, they can go as crazy and as raw as they want, without stepping outside their brand zone, of course. What’s more, if you think about it strategically, Instagram Stories are the best fit for shoppable content. They’re based on a real-time, impulse feeling of ‘want, need and buy’! But how exactly? The best inspiration comes, as usual, from brands and businesses that are known to innovate in social media. Lowe’s is one such brand, with a long history of breaking out of the box. However, one campaign got them thinking inside the box. 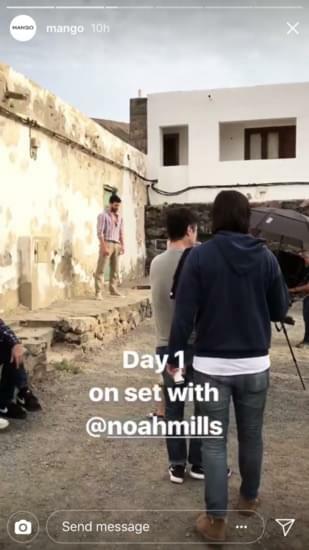 Actually, inside the frame of Instagram Stories, with a campaign that creatively used the Stories format to prove how to decorate small spaces. Few brands are doing Instagram Stories like barkbox. Their storytelling skills are simply amazing. But how can they be anything other than awesome, when they have such amazing puppies to tell stories with? 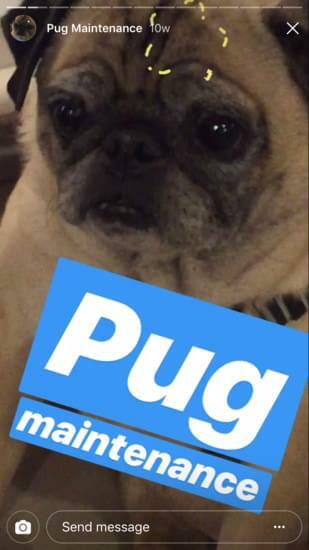 One of their most loved characters, the pug, is the main hero of various stories and a lovable dog indeed! 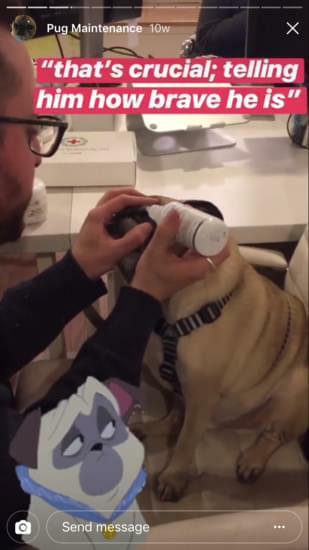 The pug is used in interview-like stories with employers or other dogs, keeping things fun and light, as the brand itself. Sephora is among the first beauty retailers to hop on the Instagram Stories wagon. And it shows! Their strategy incorporated make-up tutorials, exclusive deals and behind the scenes glimpses. In 2018, they did and Instagram Stories takeover from Coachella and promoted their #SephoraCoachella tent with a series of cohesive gifs, videos and even polls. Online shops are in the best place for creating shoppable Instagram Stories with links. And, if you have an online store, but you haven’t yet made it to the 10,000 followers milestone so that you can add links to your stories, don’t sweat it. You can always include the link in your bio and send followers there. As long as you make your Stories engaging, you’ll hit it out of the park! What is traveling if not the best way of cherishing the present moment? If in our daily lives we might be more focused on our future or trying to make something out of our past, when we travel we want to forget it all and connect with what we’re experiencing now and here. And travel and tourism professionals can leverage this mindset by using Instagram Stories. It sounds like a match made in heaven, right? The Blonde Abroad is an inspiration when it comes to how Instagram Stories can work for travel bloggers and other professionals in the branch. She keeps her stories fascinating and informative. 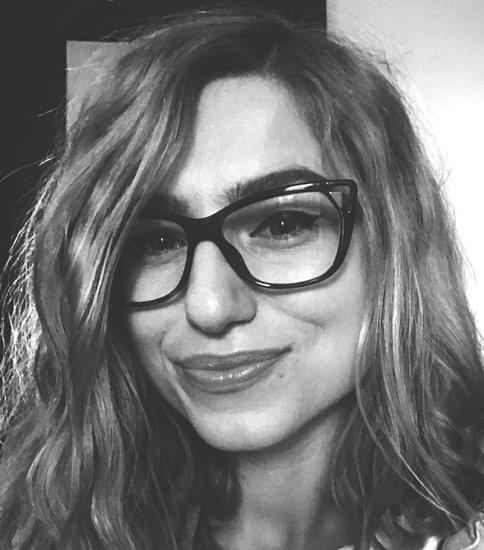 Her narrative is a mix of tips, tricks and beautiful sceneries. Airbnb knows that traveling is more than (just) a series of wonderful places. They truly live up to their mantra of getting people closer and more involved with the places they visit. And their Instagram Stories are no exception. While the photos they display are purely gorgeous (and professional), they don’t just post them as they are. Instead, they transform them into interactive quizzes that do wonders for engagements. Polls in Instagram Stories really work! To create the best Instagram Stories in your travel niche, you must follow the same principles you adhere to when traveling. First, you must stay in the moment and share it with your followers. Secondly, you must find out the story of the places you’re visiting and create a narrative around it. Of course, don’t forget to use locations and hashtags to give context and increase your reach. And, if you’re sponsored by partners, add shout-outs and mentions. And, when everything else fails, don’t be afraid to experiment! It works best. Instagram Stories are not only a great way for big brands and famous Instagrammers to promote themselves. Actually, stories are your best chance as a small business to grow and expand your reach. 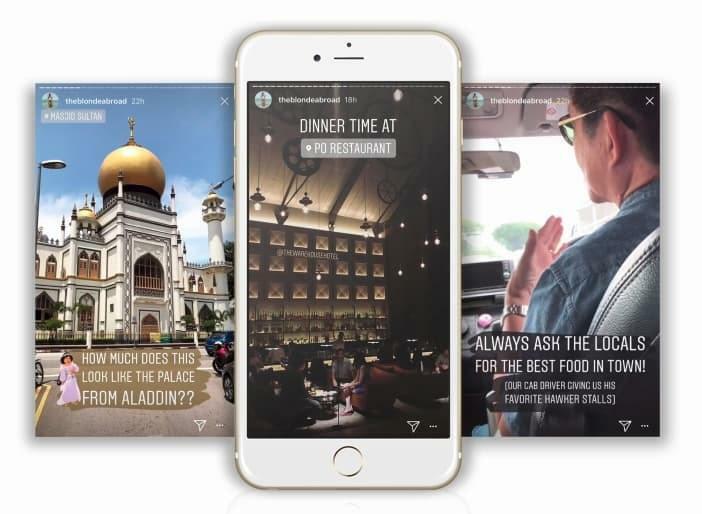 Since the algorithm behind Instagram Stories is only timeline driven, that means you’re chances of gaining visibility in front of your followers are doubled, tripled, quadrupled! Okay, we got a bit excited there, but you get the point! 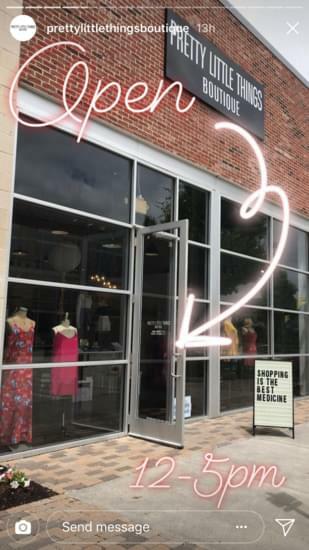 Pretty Little Things Boutique does an awesome job creating Instagram Stories that are informative and authentic. Since their main objective is to let potential clients come to know and love the brand, their Stories revolve around creating product presentation videos. Instagram’s success is partly based on its willingness to listen to the data they collect on user behavior and follow their team’s creative intuition. That means being flexible, constantly adapting and, of course, updating. In the short time since it’s launch, Instagram Stories already burned a lot of steps, releasing rollout after rollout and creating new ways to communicate. And we’re certain that the story won’t stop here. And you shouldn’t either. To stay up to date with the latest news keep a close eye on our Preppr blog. We’ll be constantly keeping you up to date with the latest releases and the best tips and tricks on how to make the most out of Instagram’s tools. And since now you’re a master in Instagram Stories, also get a hold of your Instagram feed with Preppr. After all, every great marketing amazon needs a sidekick for support. And Preppr can be your double-edged tool to cut through the jungle of Instagram. With Preppr you can choose direct publishing and have your posts long scheduled before their time even comes. This way, you’ll have a stronger grip on the aesthetics of your feed and maintain a coherent brand image. Of course, that’s just one of the main benefits. And, to make things even better, Preppr also lets you in the best times to post. Just so you can go that extra mile for that extra engagement. We’ve barely begun to scratch the surface of how to get ahead of the curve on Instagram. But if you want to be the leader among your many, many followers, stick with Preppr. You even get a 10-day free trial. So, just like Instagram Stories encourage you to, seize the moment and seize Preppr!